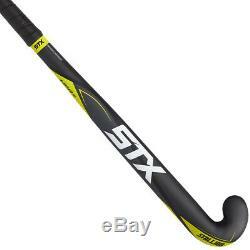 STX Stallion HPR 401 Senior Field Hockey Stick - Black, Yellow (NEW). Model Number: FH 914 MX. Sizes: 35", 36.5", 37.5. Maxi toe for an increased receiving area. Balanced bow shape allows for easier control. 40% Carbon for intermediate players who need more power. Optimal balance point to provide power and a lightweight feel. 40% Carbon, 55% Fiberglass, 5% Aramid construction offers long lasting durability. The STX Stallion HPR 401 Senior Field Hockey Stick is the ideal choice for an experienced player who wants more power. The HPR 401 Stick is made from a Carbon, Fiberglass, and Aramid construction that makes for a powerful as well as durable stick. The Optimal Balance Point provides a mix of a lightweight feel and power that is perfect for slamming home shots. Overall, the STX Stallion HPR 401 Senior Field Hockey Stick has everything you need to take your game to the next level. The item "STX Stallion HPR 401 Senior Field Hockey Stick Black, Yellow (NEW)" is in sale since Wednesday, May 23, 2018.